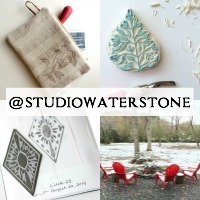 Studio Waterstone | Lori Plyler Art: a book tour and a giveaway! a book tour and a giveaway! 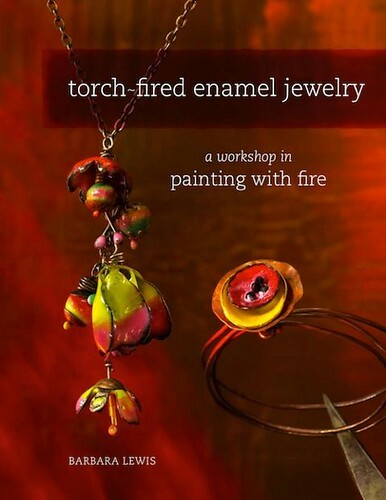 Imagine how excited I was when asked to be a part of Barbara Lewis' Virtual Book Tour - 16 days of people sharing information about Barbara, her book, Torch-Fired Enamel Jewelry, and the art of torch-fired enamel jewelry. Click here for my layman's review of Barbara's new book. I've got all sorts of things in store for you today, including a great giveaway. First, as the only non-jewelry artisan (I think) on the tour, I'd like to show you my appreciation for this art and tell you how it's incorporated into my designs. 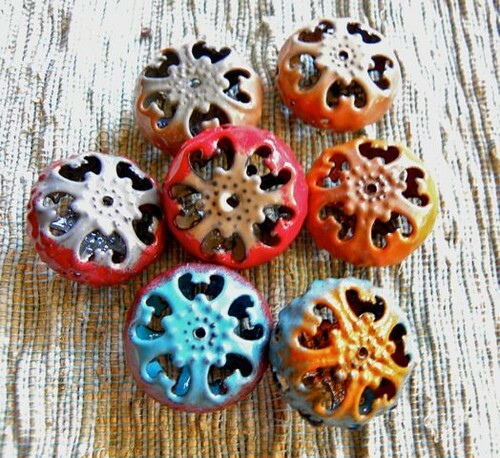 Since torch-fired enamel beads are so vividly colored, they make ideal accents, as shown here with the tabbed pull. The beads are also combined with leather and used as the focal point for the modern applique flowers on this recycled wool key pouch. As a handbag designer, handcrafted beads add a special touch to my bags and I love sharing these one-of-a-kind items while promoting the artists who create them. There will be prizes throughout the book tour plus a grand prize at the end. The more you spread the excitement, the more chances you have to win some of the goodies each blogger is giving away! Leave a comment here, on Lori's blog, and become a follower = 1 chance. Tweet, Facebook or blog about the giveaway and leave a comment at this post (the original Virtual Book Tour post) = 1 additional chance. While you're visiting Barbara's blog, if you become a follower or say that you're already a follower in your comment = 1 additional chance. You can earn up to three chances per daily giveaway. A winner will be selected by 10 p.m. eastern time and be announced the following day. You can check back at Barbara's blog for the name of the winner or at any other of the participating blogs. To thank you for following along, we will have a BONUS PRIZE at the end of the book tour! All of the entries will be included in the drawing for a kit containing all the elements of "Floral Cascade," one of the projects in the book. You'll receive everything you need to make the necklace, including the chain, jump rings, clasp, enamel beads, and head pins! But that's not all! Really? Seriously? Seriously. 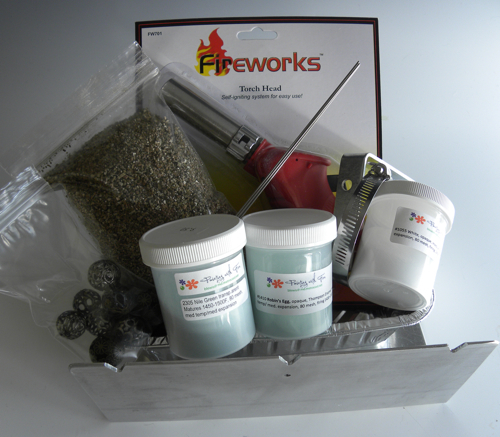 For a chance to win the Grand Prize - a Torch-Firing Kit (or $110 shopping experience at www.paintingwithfireartwear.com) - please leave a review at Amazon.com by November 24. Remember, leave an honest review... the book must stand on its own. Thanks for playing along! This is going to be a lot of fun! P.S. Unfortunately, we have to restrict the giveaways to U.S. residents. Winners should contact me with their name and address through my author website: www.torchfiredenameljewelry.com so that you can receive your prizes!" P.P.S Want to see the Featuring Studio Spaces peek into Barbara's studio? Just click here. Wow! I got so excited about your give away I almost forgot to post! Thank you for your generosity! What sweet adornments your enameled pieces make!!!!! I'm aready a follower of your blog. Oh man Lori, I hadn't seen your pieces with the enameled components! That blue really pops off the pouch. What a beautiful piece. And I'm already a follower of your wonderful blog! Would love to win - and the enamel and the leather look AHmazing together! oh awesome! 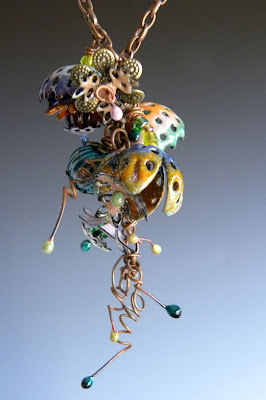 I love the way you use beads and the enameled pieces into your work. Beautiful! I love how you use the enamel on your work. Your "recycled leather" bags are amazing! Love how you use beads with your handbags and pouches! Already a follower! 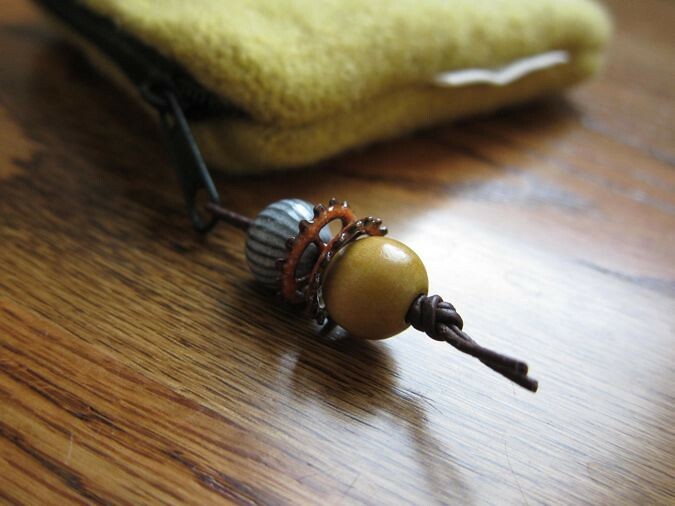 I never dreamed of using the torch fire beads for handbags.Great Idea and wonderful pouch you made.Barbara 's New Book is the so detailed on everypage.This Virtual Book Tour is amazing.I am a follower. of your blog. You have made an ingenious combo with Barbara's beads and your textiles.....perfect! I'm an avid follower and the enameled beads add a special flair to your one of a kind beauties. I'd be tickled to win this give away. I have this book and enameled fire beads are on my bucket list. I see endless possibilities. They are perfect for your work! 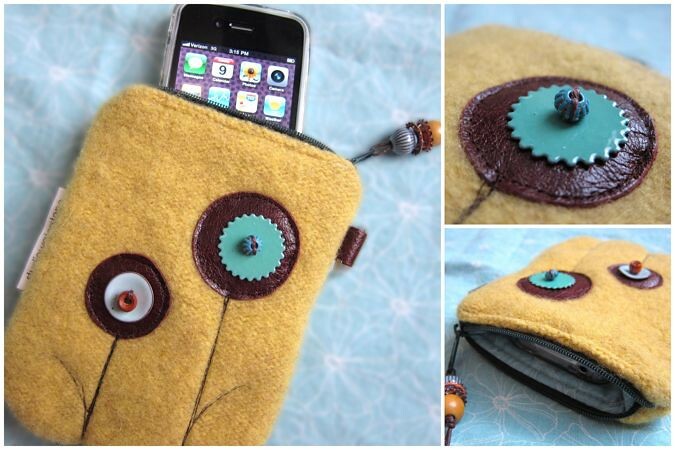 I love that zipper pull. thank you for being a part of this virtual tour! I love seeing all this creativity. I am signing up to be a follower! I knew you'd nail it! Beautiful work as always! Your work is new to me, so I'm thrilled to see such beautiful bags...I love your work! And I'm a new follower too. Enjoy your day! Love your creations-can't wait to get started with Barbara's book! I really like the way you've incorporated enameled beads into your pieces. They're so pretty! this is a great example of collaberation! I am now a follower! Lori, I love, love, love how you incorporated the beads in your designs! GORGEOUS!!! As a host I won't be part of your giveaway but wanted to comment anyway. The enameled accents are a perfect fit with your bags and designs, the colors and styles match so well! Love it! It's so nice to discover a new artist! Your handbags are delightful! I am now a follower of your blog, and would LOVE to wind those beads! ...and I follow Barbara already as well! I know I can't win, but I just had to comment. You are utterly cool, Miss Lori! I love that little special touch! I was so bummed when The Ultimate purse that I had loaded in my cart was snatched away and sold to someone else. I think it actually left a scar on my soul to think that it wouldn't be on my arm. Makes me ever hungrier to have the perfect bag from you. Your attention to details is amazing! Enjoy the day! The enameled accents are just perfect for your bags and pouches. I'm already a follower of your blog and Barb's. This tour is giving me all kinds of ideas. The bag alone is gorgeous of course! But the sweet attention to detail by adding the little charm - ahhhh...LOVE it!!! Lori, I love your use of the enameled pieces as accents on your items. I have admired your work for some time and just became a follower of your blog. This is a delightful giveaway. Thanks. I am really enjoying this tour! I am discovering such talented artists and informative blogs. I love your use of the enameled beads and look forward to following you. I love the way you incorporate the enameled pieces into your work. I will give it a try. Haven't won anything yet whenever I do this. Such a great post! Love the way you accented your work with the beads! Sweet giveaways!!! Love the little case! The enameled components look great and the colors are so pretty!! I do follow your blog. Thanks for the opportunity to own that lovely enameled set! OMG those beads are just wonderful!! And thanks for the idea of using enameled pieces as accents! They add their own zing! Ohhhhh....such pretty beads!!!! Love, love, love them- please enter me to win them! I also signed up to follow your blog- I am just now joining blog book tour fun- what a great idea! I love that you're a non-beading user of these beads. Makes me want to do other things with them than beading. Hope I win so I can try it out! I'm a new follower. Thanks! I am a follower of Barbara already! Love your work Lori definitely a new follower of your blog. I always seem to comment to late for the giveaway :( but very happy to have your site in my faves. Lori, your pouch is so sweet. You put together the neatest colors and designs...and the details like the enameled beads. Who would have thought? i think it's great how you've shared an idea using beads in a non-jewelry design! I love the way you use the beads...to add such fun to your bags, they add such fun! I love getting to visit new designers and the beads are beautiful!! I just found out about the virtual tour tonight, but will be following along with it every day from now on. I really like the way you decorated your bag with the enameled pieces. I love your idea of the virtual book tour. I just discovered your website and am very excited. Thank you for the inspiration.